10 minTokens are the core method for authentication within Vault. For every authentication token and dynamic secret, Vault creates a lease containing information such as duration, renewability, and more. This guide helps you understand the lifecycle of tokens. 10 minThis guide demonstrates the commands to create entities, entity aliases, and groups. For the purpose of the demonstration, the userpass auth method will be used. 10 minAs of 0.11, ACL policies support templating to allow non-static policy paths. 10 minThis introductory guide walk through the mechanism of Vault clients to authenticate with Vault. There are two approaches at a high-level: platform integration, and trusted orchestrator. 5 minThis guide is an introduction the Vault Agent which was introduced in Vault 0.11. Its basic usage is demonstrated using AWS auth method as an example. 7 minThis guide demonstrates the Auto-Auth method of Vault Agent using Kubernetes auth method on the server side. 5 minThis guide is an introduction the Agent Caching feature which was introduced in Vault 1.1. 10 minAuthentication is a process in Vault by which user or machine-supplied information is verified to create a token with a pre-configured policy. 10 minThis guide discusses the concepts necessary to help users understand Vault's AppRole authentication pattern and how to use it to securely introduce a Vault authentication token to a target server, application, or container. Enterprise Only: Sentinel is a part of Vault Enterprise Premium. Sentinel is a language framework for policy build to be embedded in Vault Enterprise to enable fine-grained, logic-based policy decisions which cannot be fully handled by the ACL policies. This guide walks you through the authoring of Sentinel policies in Vault. For ACL policy authoring, refer to the Policies guide. What if the policy requirement was to grant read permission on secret/orders path only if the request came from an IP address within a certain CIDR? Use Sentinel policies (RGPs and/or EGPs) to fulfill more complex policy requirements. To perform the tasks described in this guide, you need to have a Vault Enterprise environment. This guide demonstrates basic Sentinel policy authoring and management tasks. import - Enables your policy to access reusable libraries. There are a set of built-in imports available to help define your policy rules. main (required) - Every Sentinel policy must have a main rule which is evaluated to determine the result of a policy. <variable> - Variables are dynamically typed in Sentinel. You can define its value explicitly or implicitly by the host system or function. NOTE: The Sentinel language supports many features such as functions, loops, slices, etc. You can learn about all of this in the complete language guide. Any incoming request against the "secret/accounting/*" to be performed during the business hours (7:00 am to 6:00 pm during the work days). Any create, update and delete operations against Key/Value secret engine (mounted at "secret") must come from an internal IP of 122.22.3.4/32 CIDR. The main has conditional rule (when precond) to ensure that the rule gets evaluated only if the request is relevant. Refer to the Sentinel Properties documentation for available properties which Vault injects to Sentinel to allow fine-grained controls. You can test the Sentinel policies prior to deployment in orders to validate syntax and to document expected behavior. First, you need to download the Sentinel simulator. Create a sub-folder named test where cidr-check.sentinel and business-hrs.sentinel policies are located. Under the test folder, you want to create a sub-folder for each policy: cidr-check and business-hrs. NOTE: The test should be created under /test/<policy_name> folder. Write a passing test case in a file named success.json under test/business-hrs directory. Under global, you specify the mock test data. In this example, the weekday is set to 1 which is Monday and hour is set to 12 which is noon. Therefore the main should return true. Write a failing test in a file named fail.json under test/business-hrs. The mock data is set to Sunday at noon; therefore Therefore, the main should return false. In this example, the global specifies the create operation is invoked on secret/orders endpoint which initiated from an IP address 122.22.3.4. Therefore the main should return true. Write a failing test for cidr-check policy, test/cidr-check/fail.json. This test will fail because of the IP address mismatch. However, the precond should pass since the requested operation is create and the targeted endpoint is secret/orders. The optional test definition adds more context to why the test should fail. The expected behavior is that the test fails because main returns false but precond should return true. NOTE: If you want to see the tracing and log output for those tests, run the command with -verbose flag. advisory The policy is allowed to fail. Can be used as a tool to educate new users. soft-mandatory The policy must pass unless an override is specified. hard-mandatory The policy must pass no matter what! 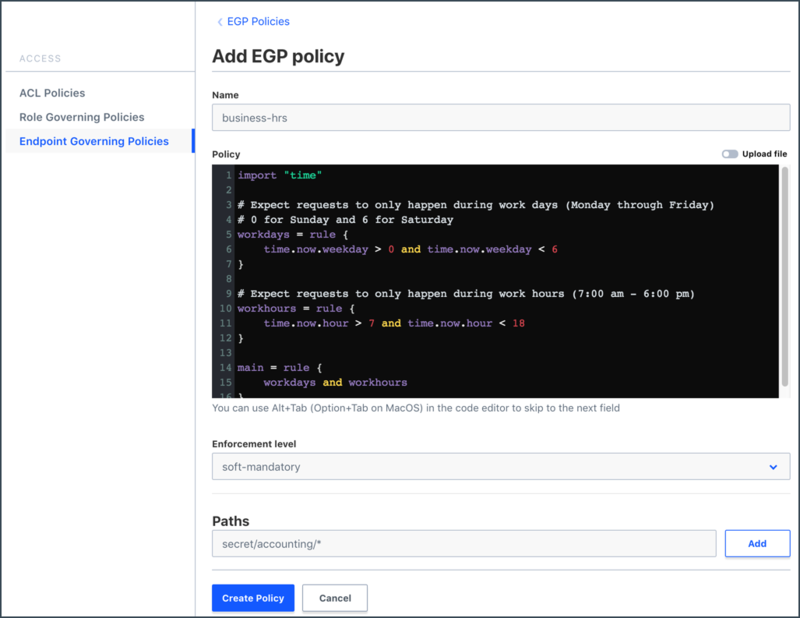 Since both policies are tied to specific paths, the policy type that you are going to create is Endpoint Governing Policies (EGPs). Store the Base64 encoded cidr-check.sentinel policy in an environment variable named POLICY. Create a policy cidr-check with enforcement level of hard-mandatory to reject all requests coming from IP addressed that are not internal. Repeat the steps to create a policy named business-hrs. Where <TOKEN> is your valid token, and <PAYLOAD> includes the Base64 encoded policy, endpoint paths, and enforcement level. Create the API request payload. Repeat the steps to create a policy named business-hrs with enforcement level of soft-mandatory. You can list the EGPs that were created. Select Policies and select the Endpoint Governing Policies tab. Enter business-hrs in the Name field. Enter the business-hrs.sentinel policy in the Policy editor. Select soft-mandatory from the Enforcement level drop-down list. Enter secret/accounting/* in the Paths field, and then click Create Policy. Select Endpoint Governing Policies again, and then Create EGP policy. Enter cidr-check in the Name field. Enter the cidr-check.sentinel policy in the Policy editor. Leave the Enforcement level as hard-mandatory, and enter secret/* in the Paths field. NOTE: Unlike ACL policies, EGPs are a prefix walk which allows policies to be applied at various points at Vault API. If you have EGPs tied to "secret/orders", "secret/*" and "*", all EGPs will be evaluated for a request on "secret/orders". Once the policies were deployed, create, update and delete operations coming from an IP address other than 122.22.3.4 will be denied. $ vault kv put secret/accounting/test acct_no="293472309423"
Error writing data to secret/accounting/test: Error making API request. * egp standard policy "cidr-check" evaluation resulted in denial. Similarly, you will get an error if any request is made outside of the business hours defined by the business-hrs policy. Warning: As with ACL policies, root tokens are NOT subject to Sentinel policy checks. Therefore, use a non-root token for verification test. Select Delete from the policy menu for business-hrs. When prompted, click Delete again to confirm. Repeat the steps to delete cidr-check policy.